I trust this team, not only because of their professional, but also because of their service. I like to cooperate with them, since they all stand at my side to consider everything. The series of equipment combines the rinsing, filling, sealing functions on the same machine. The design of the machine is scientific and reasonable .The appearance is beautiful and the function is complete. Its operation and maintenance is convenient. And its automation is high. 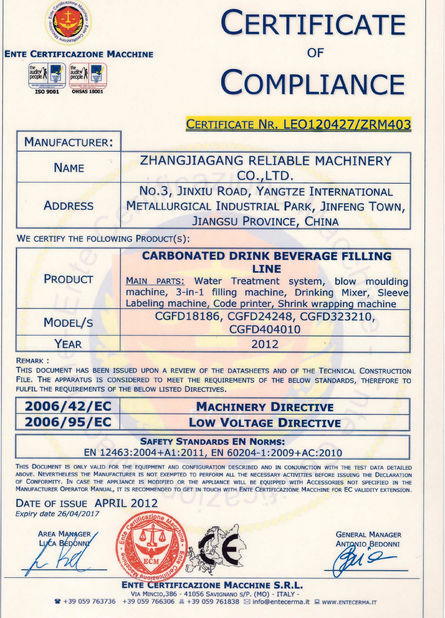 The whole machine is controlled by PLC with touch-screen as the interface between human and machine .The amount of the drinks in the drink tank can be controlled automatically. 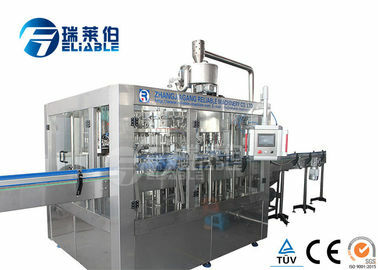 The filling and capping will be stopped automatically when there is no bottle .When bottles are cramped wrongly or when caps are not available, the machine can be stopped automatically. This part is made up of lifting device, the main transmission device, the fixed frame, clamp device, distributor, and open clamp cams and over turn cams etc. Lifting device is used to adjust the height of the rotary tables and clamps of machine to adapt to the bottle height. Its power comes from the lifting lever. Lever rotates drive screw rotation to realize the rotary tables lift. 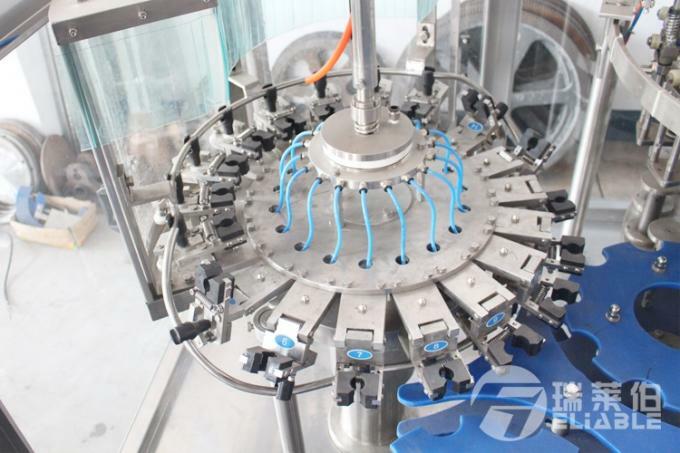 When the clamp rotate to star wheel with rotating table, bottle into the middle of clamp, open clamp cam close the clip claw and clip the bottleneck with the rotating clamp. When rotary tables to rotate, clamp pieces will rotate with over turn cam, guide cams rotates around over turn cam and flip the bottleneck to 180 degree till the bottle mouth is top downwards and directly face the spray nozzle, then the clean water in the spray nozzle sprays and wash the inside of the bottle, Drain, turn 180 degree downwards and then goes out from the star wheel. Beer filling machine is specially designed according to the beer feature, and the filling part is designed to be twice pre-evacuation. 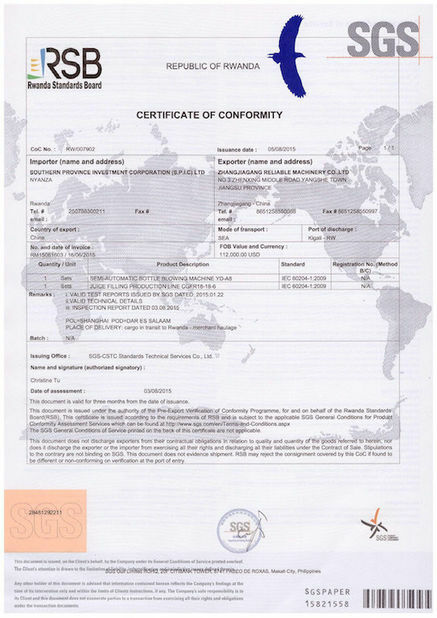 The filling part is made up of main liquid pipe, rotating cylinder bearing base, filling cylinder fulcrum loop, wine or carbonated drink tank, filling valve, filling cylinder pipe, control loop device, ascending device, the distributor, height adjusting control, stimulating bubble arm, vacuum system, etc. Open the Vacuum valve stem, in the bottle and vacuum channels forming a road. The air in the bottle will be discharged from bottle through this channel, in the bottle will form a vacuum. After reach the fixed time, Vacuum valve closed, then it will be finished. Open the filling valve, a pathway is formed between the bottle and the gas channel. The gas filling into the bottle through this channel till gas pressure in wine tank equals to the beer tank pressure. After gas injection into the bottles, little air will be concentrated on the top of the bottle neck. By the second vacuumizing, this part of resting air will be removed and generate a slight-vacuum state, which is better for the filling work. After the bottle finish filling stand for long time, close the liquor valves and air filling valves, cut off the channel between wine tank and bottle. Open the discharge valves and form a pathway between bottle and air. The pressure in bottle will release through this channel and don’t finish release until bottle separate from filling parts. When the filling parts locates between bottle-out and bottle-in star wheel, open the gas filling valves and close it after reach the fixed time. So that the gas in bottle will blow the remaining liquid. The capping machine is made up of cap holder, capping slideway, capping upper part, capping lower part, elevating part and anti-circling column. The up and down movement of the capping nozzle is driven by the capping cam, which is fixed. The screw or crown caps (one machine can only has one kind of capping part) are sending to the cap slideway by a mixer in the cap container, and then slid to the capping mould of the capping nozzle. The capping nozzle is driven by power and move in circle. The capping nozzle would move upword and downward one time in each circle of the capping. The cam, set up in the upper fixed part of the capping machine, controls the upward and downward movement of the capping nozzle. 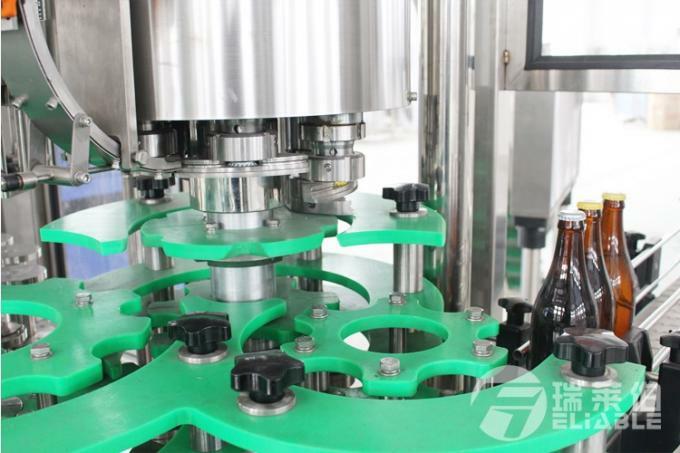 After the bottle is transmitted from the filling machine, the capping nozzles have been fed with a bottle cap. 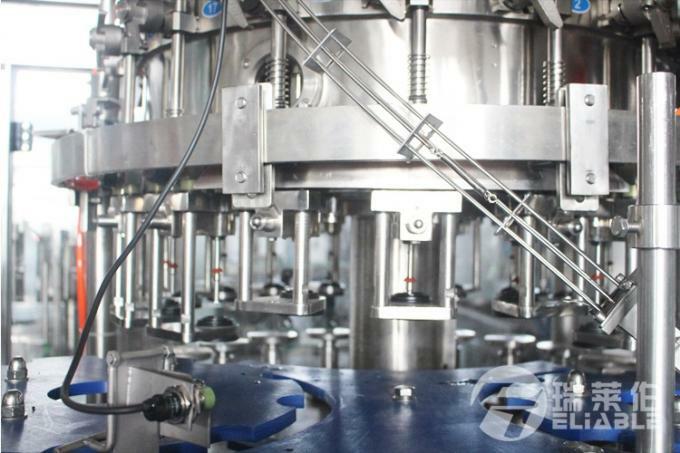 The capping nozzles moves downwards the bottle under the capping platform driven by cam guideway, then the bottle cap with the aid of the damping ring. 1. Engineer will be sent to your side as soon as you get all your machines ready.